Portuguese railway company bond certificate of the CCFG. Issued in 1905 to finance the extension of the Guimarães Railway to the town of Fafe, and to buy rolling stock. / Image: Public Domain license. Credit or debt is an important part of the capitalist economy. Its effects and uses are multiple. One of these is its service in maintaining the regular flow of capital from end to end. It does this by reducing the need for otherwise inactive funds in the form of savings and injecting liquidity where there’s a lack. On the other hand, debt confines activity by placing demands on the future of capital by requiring it to pay interest in addition to other costs. These are but two aspects of a complex system of finance. I mention them in passing in order to bring to mind the functional importance of credit in the circulation of capital. Credit has the potential to address the issue of irregular circulation but it creates very serious problems as well for capitalism, some of the consequences of which are illustrated by events leading up to and following the economic crisis of 2007-2008. Debt as a share of the total economy has grown steadily the world over. It has climbed even higher since the crisis of 2007-2008. Source of data: Bank for International Settlements, accessed 24 October 2018. 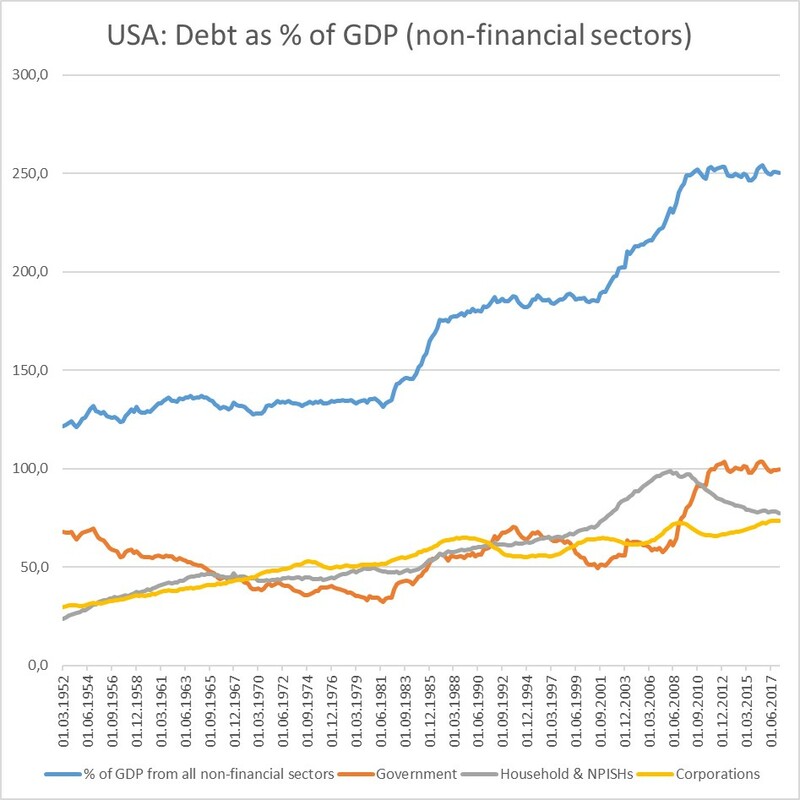 Unless otherwise mentioned, all charts and statistics in this post are derived from a database (called Credit to the non-financial sector) provided by the Bank for International Settlements. Based in Switzerland, the organisation is composed of sixty central banks. Debt as a share of the total economy spiked during the economic crisis of 2007-2008. Its burden increased significantly more for emerging economies than for the advanced ones. So, those countries that are economically weaker have, on the whole, increased their debt burden at a greater pace. The impact of this was recently felt with fears over the capacity of these emerging markets to pay back their debts. Turkey and Brazil frequently featured in this story, highlighted by the tumble of their national currencies. Of course numerous countries were affected, from debtors to lenders. The currencies of Brazil, Turkey, India, Indonesia, and others, dropped at a rapid clip while their governments and central banks hustled to compensate. The growth of debt post 2008 takes place in the context of general as well as particular events. The world’s economy shrank by – 1.73% in 2009, according to the World Bank. Growth has been small following that, and has steadily decreased over the past decades. This is very much geographically differentiated (uneven geographic development). China’s economy has grown while the European Union’s has struggled to do so. There are marked differences within the EU as well, with German growth and Greek decline. Furthermore, various sectors of the economy and the organisation of supply chains are undergoing structural changes. These include the expansion of monopolies and related oligopolies and monopsonies (i.e. Google, Amazon, Walmart). Socially, class differences are in most cases accentuated with a growing disparity between the ultra-rich and the rest, with noticeable differences according to gender, and within racialised societies. 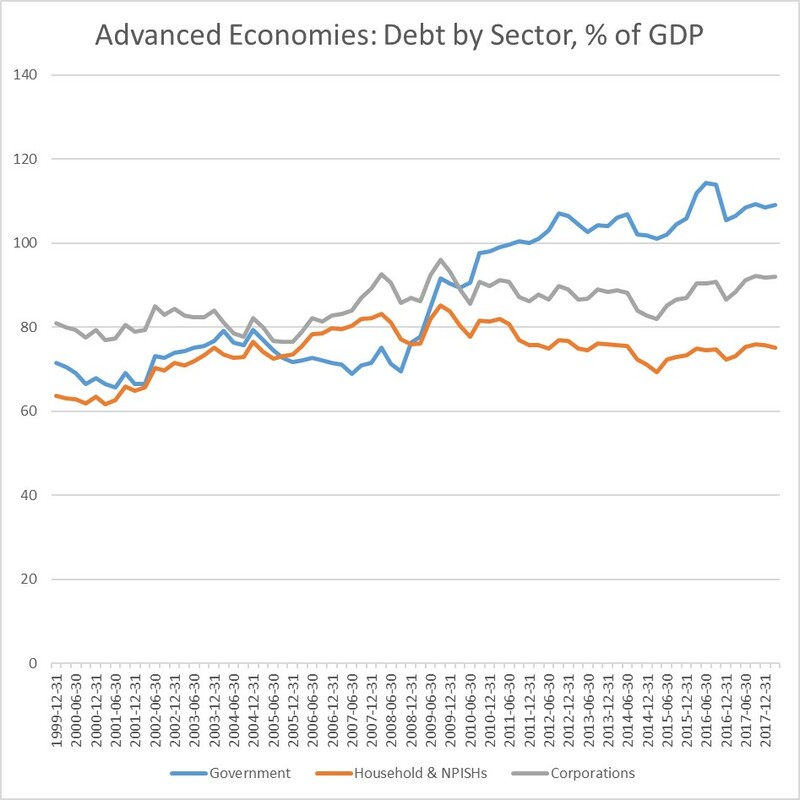 The breakdown of debt by sector varies for emerging vs. advanced economies. 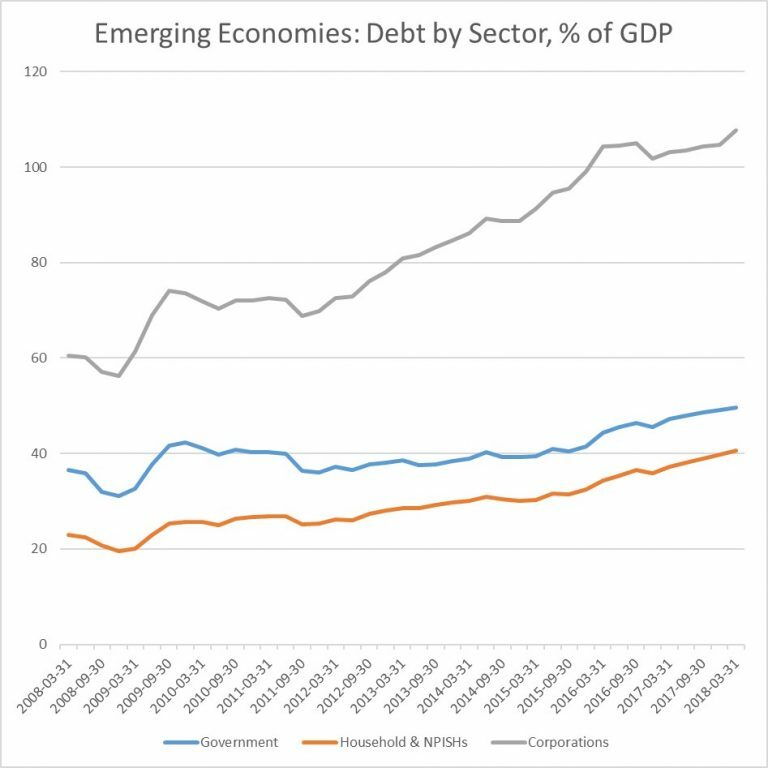 In advanced economies, government debt expanded very rapidly following 2008, while the sharpest increase in emerging markets was in the non-financial corporate sector (in private and public ownership). Emerging markets also saw a significant increase in credit issued to households and non-profit institutions serving households (NPISHs). The Bank for International Settlements has released a report that reveals an increase in the number of so-called zombie companies in a study of fourteen of the world’s advanced economies. These businesses are called zombies because they’re “unable to cover debt servicing costs from current profits over an extended period” (from report: The rise of zombie firms: causes and consequences). Such firms have increased in number since the late 1980s, and have continued to grow in scope and perseverance despite brief declines during the last two economic crises (2000, 2008). It’s important to note that these statistics capture only part of the economic situation and should be regarded within a broader context. For example, household debt relative to GDP doesn’t capture the capacity of segmented and classed households to pay down debt at various points in time. As real incomes stagnate or decline, households may find it more difficult to pay down debt, especially if interest rates increase. This may be true even if household credit as a percentage of total GDP declines. The surge in China’s use of credit as a response to the crisis of 2007-2008 is evident. 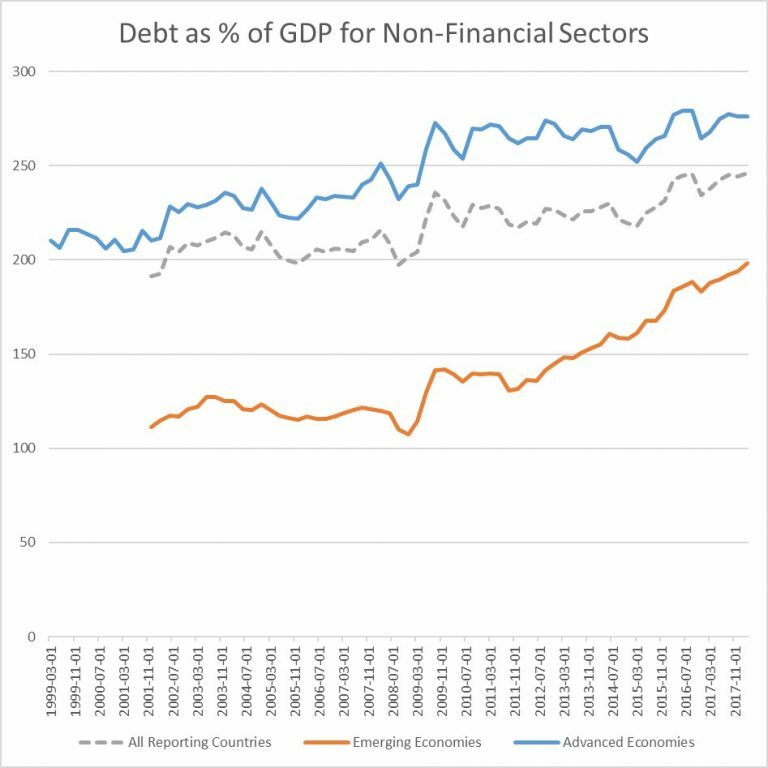 That country’s use of credit by non-financial sectors went from under 150% of GDP in 2007 to over 250% in 2018. 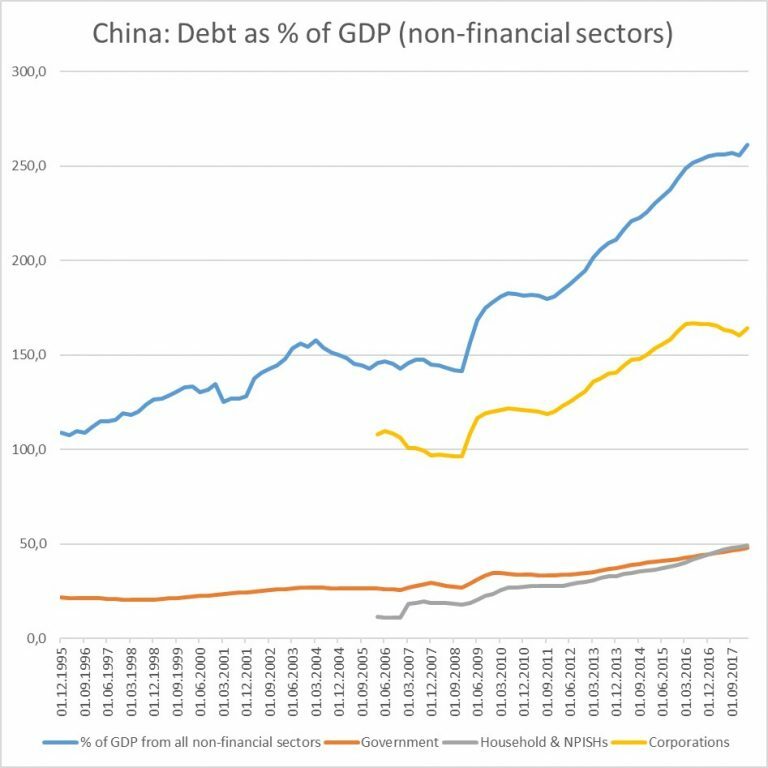 Corporate credit has been the largest contributor to China’s increased burden of debt. Remember that the corporate sector shown in the chart includes both privately and publicly owned firms. The rise of household and NPISH credit is also notable since it rose from humble beginnings. Though I’ve not adequately looked into it, there’s a good likelihood that this relates to the increase in private household and consumer credit being made available in that country. For example, consumer credit in China totaled 35.7 trillion yuan in September 2018, up from 5.9 trillion yuan in January 2010 (source Trading Economics / People’s Bank of China). Even though the case of the US seems rather different from that of China, they share an important similarity. Both of them have used the instruments and institutions of the state to compensate for the crisis of 2007-2008. The US took on debt via its treasury while China leveraged its state-owned enterprises. 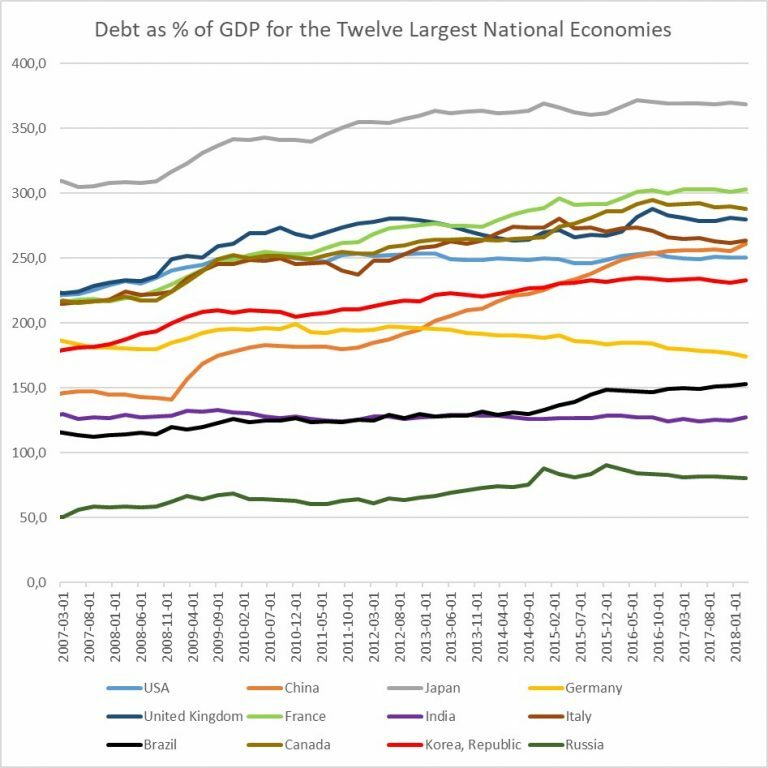 In the case of the US, state debt would show up as a ‘government’ one while China’s can appear ‘corporate’. They did use different methods from one another in taking on credit. They also had other options at their disposal than those which they ended up using. This is to say that the monetary measure of an activity, via credit or otherwise, is not equal in all cases. The unit of money is a useful measure but it also hides important distinctions. For example, the combined private and state/public expenditure for health care may be equal in two separate instances but one country’s medical care may be far more effective than the other’s. Such is the case in the US, which has one of the world’s most expensive but poor performing health care systems. All of the charts derived from the Bank for International Settlements are part of a more comprehensive Excel spreadsheet, along with complete and focused tables. I’m happy to share the spreadsheet with anyone who’s interested. You can request a copy via comments (below) or by sending me an email.